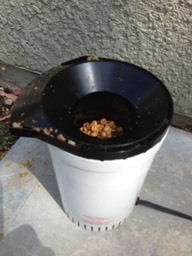 An attempt to roast coffee with a popcorn popper. In this video the beans have been roasting for just a few minutes. Listen for the beginnings of the first crack, and note the chaff. There is a bit of smoke at this point, but it picks up! The beans have now been roasting for about five minutes. Listen as the first crack takes place when moisture is being released from the beans. You won’t need to stir much as the popper does the work for you. The beans have now been roasting for more than five minutes. The beans are darker now and the first crack is still under way. 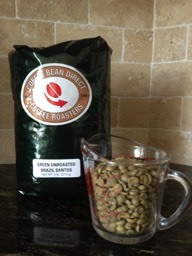 Note how the beans have expanded and now take up more room in the roaster. The beans have now been roasting for more than seven minutes. The beans are much darker and the second crack where oils are released is under way. At this point you will watch carefully for the darkening color and turn off the popper when you judge the beans are right for you. My experience has been that it will take several tries to get something you will like. You should experiment with the duration of the roast to get a milder or stronger flavor. 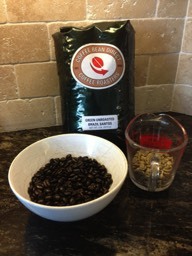 I have found that roasting for too long will result in coffee with a charred flavor, so don’t go crazy!